madeleine brown handmade: Tales from the Spooky House. Tales from the Spooky House. The Spooky House has been my archetypal house-o'-dreams since I was a wee little tacker. I used to have happy daydreams about it as I waited for the train to toddle off to school. 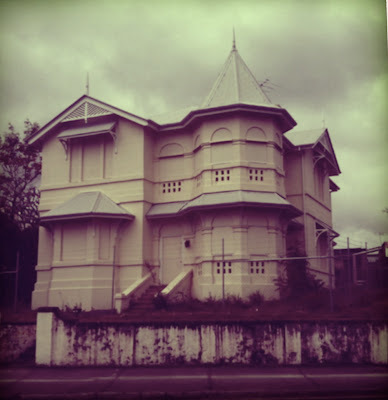 Wedged in opposite an ugly shopping village and the uglier Indooroopilly train station, it has been vacant for as long as I've known it, which is nigh-on twenty years. Not so long ago, it had a makeover- a new roof and a paint job, then all the windows got boarded up and a barbed wire fence was put up around it. Strangely it's spookier now with its blind 'eyes' than it was back when it looked like it would be full of dead pigeons. Who owns this empty masterpiece? Surely they'd be better off renting it for a pittance rather than leaving it vacant? Say, to a handmade jewellery studio/ purveyor of fine coffee? Maybe a vampire lives in it- the spooky creature du jour. Someone needs to rid its garden of Jim Beam cans and give it some love. C'mon universe- make it happen. I adore this house, I think it had squatters in it for a while a few years back. I really wish they would do something with it, the house does look ever so lonely! Me too! We use to call it 'the Stephen King house' when I was at school. Always had a soft spot for it and hope it gets a proper tenant soon. My thoughts are that it is either a listed/significant property so the owners can't demolish it and where hoping it would fall down, then when it was looking really bad the council stepped in and told them to do some maintenance, or its now a meth lab. Makes me home sick for Brisbane. It looks like an ornate cake if you squint a bit. The reasons no-one lives in it is a loooooonnnnnnnggggggg drawn out estate dispute - gotta love families who squabble to the bitter end. It got fixed up a few years ago cause the local council took the owners to court over it cause its heritage listed. Thanks Meg for clearing that up. Sad about the quabbling bit. Its a beautiful house and really should have a bunch of people enjoying it!